Show that you’re a tough, courageous woman who fought ovarian cancer and won each time you use this Personalized Ovarian Cancer Survivor Canvas Tote Bag. Be an inspiration for those who are currently fighting this disease by giving them hope and motivation every time this Ovarian Cancer Awareness Tote Bag is used.. Each Ovarian Cancer Survivor Butterfly Tote Bag is great for helping raise awareness at Ovarian Cancer Awareness Events. 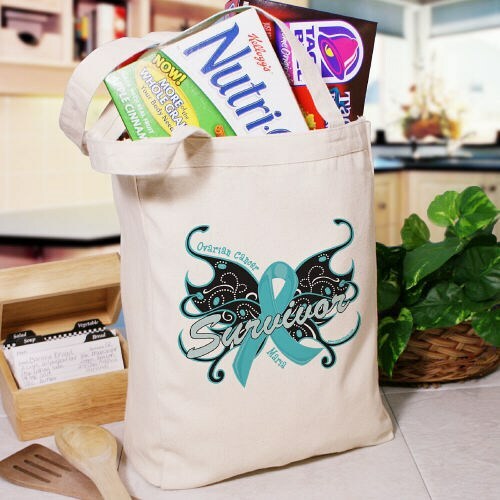 Our Ovarian Cancer Awareness Canvas Tote Bag is a 100% cotton Canvas Tote Bag measuring 16"h x 14"w. This tote bag is made especially strong to hold all of your take along items and is great for spreading awareness wherever you go. Includes FREE Personalization! We will personalize your Ovarian Cancer Survivor Tote Bag with any name.